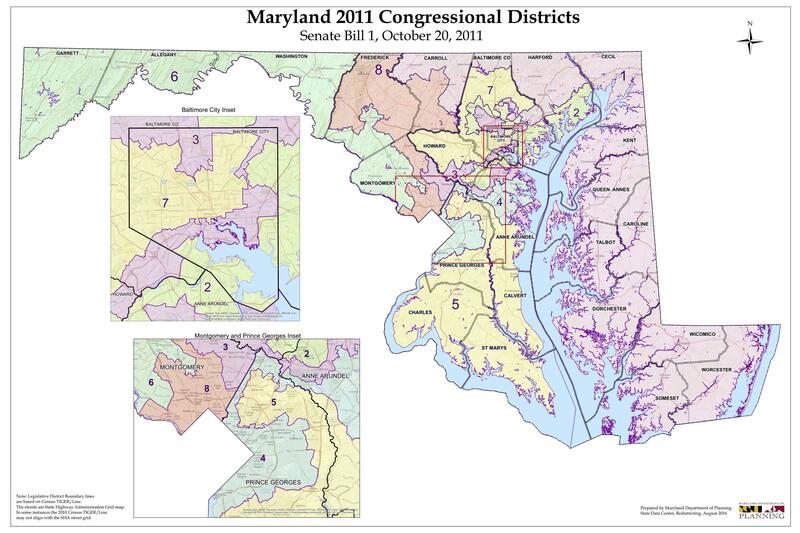 Maryland's congressional districts, as approved by the General Assembly in 2011. If the state misses the March deadline, or if the court rejects the new map, the court will appoint a commission to draw new districts. The ruling focuses on the sixth district in Western Maryland, which was redrawn in 2011 to include part of Democrat-heavy Montgomery County. Republican Congressman Roscoe Bartlett then lost his seat of 20 years in the 2012 election to Democrat John Delaney. Attorney General Brian Frosh’s office said he is reviewing the decision and whether to appeal it. Democrats in the state Senate are offering a plan that would create an independent commission to redraw Maryland’s congressional districts if five other states in the region agree to do the same. The bill was voted out of committee just as Gov. Larry Hogan’s proposed redistricting reform bill died.